Sanda is a hand to hand combative sport that adapts various components of the martial arts. Sanda also known as “Sanshou” entails at the HIGHEST level, full contact striking, kicking, and throwing competition between two athletes. Athletes are developed in a pathway that guides them through each of the required technical skills to ensure safety, competitiveness, and enjoyment of combat sport. Competitors are classed into differing weight divisions and wear protective gear and gloves, and utilize punching, kicking and throwing/wrestling techniques to win points or at the full contact level, knock out their opponents. Events are exciting and fast paced, and the added element of the platform in high performance divisions not having any boundary ropes makes matches visually entertaining. High Performance Competition bouts comprise of 3 rounds in total, each lasting two minutes with a one minute rest period between rounds. 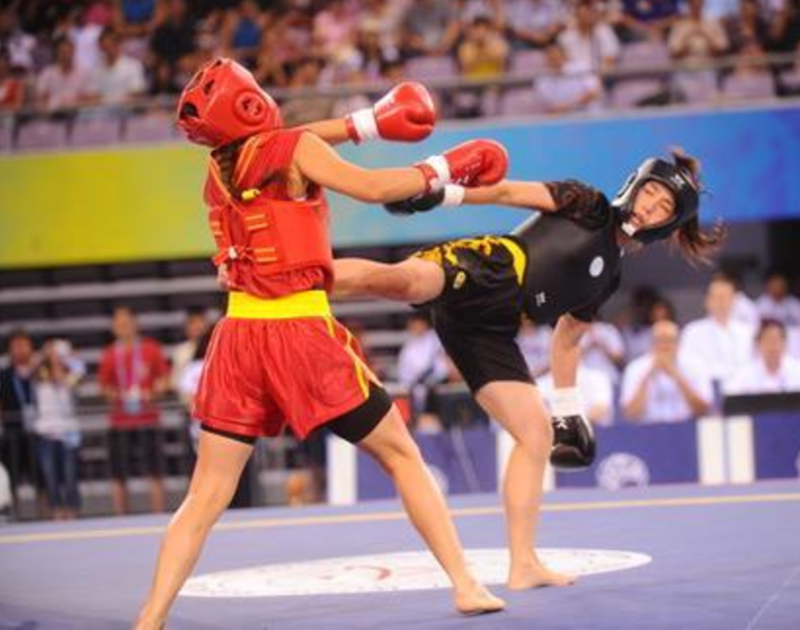 Apart from illegal blows and methods, Sanda athletes may employ punching, kicking and throwing techniques from all styles of martial arts. Valid striking areas are: the head, the trunk (including the chest, abdomen, waist and back) and the legs. The full-contact bouts are free flowing and exciting, and athletes are awarded points by the sideline judges for successfully executed techniques based on the scoring criteria. An athlete will be declared the winner if he or she wins 2 out of the 3 rounds of a bout, or if their opponent is knocked out in full contact divisions. There are 11 Internationally recognized weight categories for men and 7 for women but may vary based on the requirements of each competition. Sanda takes place on an elevated platform known as a “Leitai”. High performance and international competition bouts take place on this ring which is 80cm in height, 8m in width and 8m in length and comprises of a frame covered in high density foam with a canvas cover. Recreational sport combat development competition is conducted in the same area but without the elevated platform and/or in a smaller area depending on the age bracket, contact level and experience of the participating athletes. High Performance athletes wear an internationally adapted set of equipment that include head gear, chest protector, 8-14oz gloves and in some classes leg protection. Uniforms are typically black/red, or blue/red shorts and matching sport tops without logos and branding. Recreational and developmental athletes wear, organizer approved uniforms that include traditional gi’s or t-shirts, along with shorts or training pants. Athletes in these divisions bring their own approved equipment based on age bracket and contact level. WushuOntario provides and sanctions competition in various categories for male and female participants according to their experience and contact levels. Each sport combat pathway is uniquely designed to foster growth and skill sets to develop athletes in a safe and meaningful environment. -Full Contact division for athletes training and developing sanda at an amateur non-knock out environment and for athletes competing at the High Performance U-18 Junior competition bracket.